The module for review today is the BigBlueButtonBN integration with Moodle 2.1. I had reviewed this integration back in May 2011, after using it when co-authoring the book Moodle 2.0 for Business for PacktPub with Jason Cole and Jeanne Cole. However the functionality has majorly improved so I felt it was time to revisit it. The plugin is created and maintained by Fred Dixon. The original review in May can be found here. The activity provides an easy way for the teacher to create and manage a virtual training room / classroom on the BigBlueButton server, and for the student to log into the correct room. This module hosts the source is in GitHub, however the plugin database entry hosts the download zip files. The zipfile you download holds two folders bigbluebuttonbn and recordingsbn which need to be uploaded to your mod folder in Moodle. . When upgrading through the notifications page, the two parts installed successfully. One thing I really liked about this activity is that it ships with some default settings to test with BigBlueButton server access provided by the company, and it still does. This is a neat touch, and is worth a mention! The new global settings were just the URL for the BBB server and the security salt to authenticate. As they had the test server info, I left them be. The activity has some instructions on the plugin database entry, and a comprehensive README in the zip file. It also has a detailed integration page and step by step instructions on their website. There is also a video providing an overview on the module. This is plenty of good information but it would be nice to see a Moodle Docs page for the activity, even if it linked off to these other pages. There is not a lot in setting this activity up. You add activity from the dropdown on the course page and the select the name and choose if the students must wait for the moderator or not. You can set the join open and close times. Now with the latest version you can also specify if you want to record, the recording name and length. After that, it just works, and launches into the service. I do like the simplicity of the interface for the virtual classroom. It just has just whats needed and no more. When the recording is made, you can then add it in as a resource to your course launchpage. This is particularly useful if you want to include training sessions into Moodle as resources so that others can access them later. The students have a smooth easy experience with this activity. It either keeps them waiting until a moderator joins, or allows them in immediately. And very nicely, when they log out it returns them to the Moodle site. Yes, this is a straight forward integration with no complications. For people who are looking for the open source solution for virtual classrooms, or for a virtual training option for Moodle this is a nice easy activity to enable this functionality in Moodle 2. Stars: 4 out of 5 stars for this activity. Our only problem with this app is that it doesn’t have dial in access for voice over telephone. We have had ongoing problems using VoIP solutions due to students not following instructions to avoid feedback issues that cause major echo. We presently use Cisco webex as this has the best system overall and works flawlessly. Any suggestions appreciated as to how one can improve voice quality? 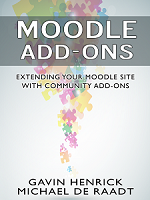 Thanks again for taking the time to review the BigBlueButtonBN integration with Moodle! We’ll continue to work hard on the product to earn that last star :-). You can have dial-in numbers with BigBlueButton. We use FreeSWITCH as the voice conferencing bridge, so you can use a SIP Trunking provider to provide you Dial Inward Direct (DID) numbers that will connect directly to FreeSWITCH (and thus the BigBlueButton voice conference). This means that some users can dial into the voice conference and others can use the built-in VoIP and all will be joined in the voice conference and appear in the listeners window (where you can mute/unmute them). Feel free to contact me directly if you need help with setting this up. Can you send me how we can setup voice conference bridge from normal phone . Best to get in contact with Fred directly for that. In terms of sound quality, make sure you are using the 0.8 version of BBB – which includes some pretty major changes focussed on improving sound quality. Can trainers break the participants into small groups with BBB like Elluminate? Hi, I use the default seting (demo server from BigBlueButtonBN). I found there is no join date options in activity setting and no calendar integration. Is it a bug for the lastest mod? Is a URL for copyrighted content also included in the copyright? You must use the somerandomthoughts.com url and link to it in any CC content re-used – yes.